Awww, Shucks…Now You’ve Made Me Blush! I have only been at this blogging thing for a short time now – I write two blogs, this one and a blog about my adventures as a music educator. Both are just starting out, with around 10 posts each, and each has very modest statistics. So, I was pleasantly surprised when Facetious Firecracker (freakin’ hilarious blog – go read it now!!) 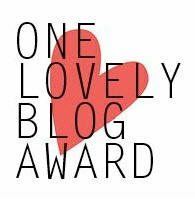 nominated Adventures with Veggies for the “One Lovely Blog Award” and the “Sunshine Award” – THANK YOU! I hate roller coasters. In fact, I hate all things that give me that feeling of your stomach jumping into your throat. Not cool. I can’t swim. I grew up in a place where I didn’t have to know how and just never got around to learning. If you threw me in the deep end of a pool, there’s a 50/50 chance that I wouldn’t make it! My entire apartment could be in shambles, but I cannot stand to have a dirty kitchen. I will often neglect other chores to make sure that the dishes are done and all of my food and cabinets are organized. I WILL NOT do laundry if it’s raining. My reasoning is that I should not have to pay to dry my clothes (I have to go to a laundromat) for them to just get wet again when I walk outside! Weird, I know. I did not make my first lasagna until after I became a vegan – weird because of my Italian heritage (half). I liked it just as much, if not better than regular lasagna! I have to sleep with something over me at night, even if it’s just a sheet over one of my limbs. When I get warm, the first part of me to come out from the blanket is a my feet! I have been singing since before I can remember. My very first solo song that I sang in front of an audience was “The Rainbow Connection” from the Muppets at my Kindergarten end-of-the-year assembly. Awesome song, even now! What is your favorite childhood memory? Playing games with my two sisters – we didn’t need board games or cards, we kept ourselves amused with our own made up world in which we got to be Disney movie characters! What is a real fear you have? Failure. I have nightmares about forgetting something at school, screwing up concerts, letting people in my life down – it’s definitely one of the biggest fears that I have. How would you describe yourself? Hmmm. I am a vegan music educator that enjoys working out, eating, cooking, reading, and staying in for a quiet night at home. When I am with people that I know, I am outgoing but I get a bit introverted when I am around large groups of strangers. What countries have you lived in? Just this one! I have visited Costa Rica but that’s about it! I would love to go to Europe (Italy and Spain mainly) when I get the chance. If you could tell people anything, what would be the most important thing to say? Stay positive – I always try to find the brighter side of things, and keeping that sort of attitude has helped me through a lot of not-so-great situations. What is one of your passions? Music – it has been a lifelong passion. I built my career around music and I love that I get to call teaching music my job! What is the one truth you have learned? You’re never given more than you can handle. It may seem that things are horrible and impossible, but they will always look up. You will always find a way, and there is always a silver lining. Once again, thank you for the honor! Thank you, also, to the bloggers mentioned above – keep writing and posting that awesome material of yours! Who are your favorite bloggers? Name some in the comments section below! ← App Review: SlimKicker and Digital Kitchen Scale GIVEAWAY! Wanted to repost here since it contains some of my favorite Music Ed people! I don’t know why I just got around to seeing this now. Thanks Julie! It’s too bad I just switched my blog. hehe 🙂 But I’m set for life with this one! Those are some interesting things about you, especially the swimming and lasagna parts. 🙂 I guess I’d never see you at Cedar Point then, regarding your #1 fact. Cedar Point is known for setting records for highest and fastest roller coasters. I LOVE roller coaster probably for the same reasons I love horror movies, the rush and the trill of it. My dad took me on the highest and fastest roller coaster at Cedar Point, at the time, and I loved it (but don’t get me wrong, I was terrified of getting on). You’re very welcome! I really like the new layout and theme of the blog – it really encompasses everything that you were going for (at least I think). Congrats! Roller coasters scare me TO DEATH! I absolutely hate the feeling of my stomach flipping…I even get that sometimes in elevators or on car rides. In fact, I have to sit in the front of cars so that I can see what is going on. The feeling of not driving and losing control gives me that same feeling!